At IKS Locksmiths we are experienced in fitting, replacing and opening all Banham door and window locks. A large proportion of our customers choose Banham security locks and we pride ourselves on our knowledge of Banham products as well as a range of other high quality locks to suit a range of budgets. We always keep up to date with the latest industry developments and the complete range of products on the market. When it comes to protecting your premises, IKS Locksmiths are specialists in the industry and use only premium products. At IKS Locksmiths we will present you with all the options available and explain the pros and cons of the various options so that you can make an informed decision and choose the lock that is ideal for you, your circumstances and your budget. We are not a Banham Locksmith however if you are looking for Banham Locks in London we can supply and fit these at competitive prices. We also stock a range of other high quality locks. At IKS Locksmiths we supply and fit a full range of branded and unbranded security products. We provide you with information to help you choose a lock which is the best value for money. 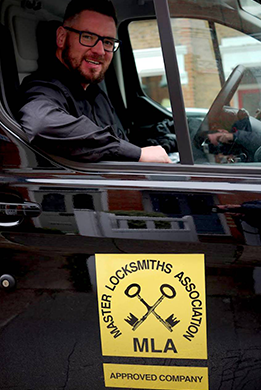 All of our locksmiths are MLA approved (Master Locksmith Association), fully accredited, and CRB Checked. So you can rely on our expert team of Master locksmiths to help you with everything from lock repairs and emergency door openings to the installation of an advanced master key system, safes and security grilles. At IKS Locksmiths we have built our business on efficiency, trust and reliability. We pride ourselves on offering competitive rates whilst maintaining the highest standard of locksmith service and knowledge within the industry. All the external locks that we fit at IKS Locksmiths are British Standard approved and marked with the British Standard Kite Mark. This is crucial as a lock without British Standard approval could invalidate your insurance policy. A significant advantage of choosing a Banham Lock is that having a registered key means that only the registered key holder or those who are authorised by the key holder can obtain a copy of the key. There are also other high security locks of this nature on the market that we would be happy to show you. At IKS Locksmiths we provide a range of locks including Banham that offer both convenience as well as high security. A Banham lock review will no doubt confirm that all Banham door locks are made with a 6 pin drill resistant cylinder that has a security key protected patent. This means you can rest assured that if you give your keys to a builder or a tradesman they will not be able to get additional keys cut. It is worth noting that, as I have mentioned before, there are other locks on the market which meet this same criteria. L2000 Rim Deadbolt: This is a self deadlocking lock that is very easy on the eye from both sides of the door. It is also one of the few Rim deadlocks on the market that conform to the latest insurance standard BS3621 2007. M2002 Cylinder Mortice Deadlock: A British standard mortice deadlock with a hook bolt, preventing intrusion from anyone seeking to spread the door. Bolt through escutcheons to add extra strength in the door as well as a high security 10” strike plate on the door frame. This is also available with an internal thumb turn to comply with fire regulations (see the M2003 model below which conforms to BS8621). EL4000 Rim Deadbolt with Electric release: The Banham EL4000 Deadbolt with Electric release is a high security auto deadlocking nightlatch perfect for a communal door or for someone who requires an electric release. With its drill resistant patented cylinder and the 10” strike plate it offers a high security lock suitable for both communal doors and houses. It comes with an electric release either standard or 12 volt DC strikeplate. This lock can also be keyed alike to other Banham registered key locks such as collapsible grilles, padlocks or door locks. Banham M5000 Cylinder Mortice Deadlock: The Banham M5000 is a BS3621 insurance approved mortice deadlock. It comes with a 6 pin patented security cylinder, bolt through security escutcheons to strengthen the door as well as a hook bolt to prevent the door being spread. This can be keyed alike to most existing Banham locks, padlocks and grilles. This is also available with a knob operation on the inside to comply with fire regulations (Banham M5008). We can fit, replace and open the full Banham range. Door locks are usually the first thought when it comes to securing a property but we always remind our clients that all windows should also be fitted with locks too. We supply the full range of Banham window locks and there is a high demand for Banham sash window locks in North London. We will survey your property and recommend the most appropriate locks for your individual needs. Lock Fitting: We fit Banham door and window locks. Whether you are looking for locks to validate your insurance policy or just to give you that extra security in your home or work place we can do the job quickly and efficiently. We carry a good range of stock allowing us to complete jobs on the spot, in most cases, without having to visit the supplier. Lock Opening: Many Banham locks are of a high specification and are often used in premises that require a higher level of security. IKS Locksmiths have both the skill and expertise to open your front door in the event of keys being locked inside or keys being lost. All IKS Locksmiths are CRB checked and all openings will require identification linking you to the property. As with locks, security Grilles from Banham are of very high quality. However don’t be mistaken in thinking there are no alternatives, because there are excellent alternatives to Banham Security Grilles. In fact at IKS Locksmiths we fit bespoke security grilles which, in our opinion, are on a par with Banham security grilles. The only difference with the bespoke high security grilles that IKS Locksmiths fit is that they don’t display the Banham logo. The absence of the logo can offer you a significant saving. We would be delighted to show you the grilles that IKS Locksmiths fit along with a portfolio of grilles that we have fitted on both residential and commercial properties. You can see for yourself the high standard of product and workmanship that we offer. We would be delighted to survey your property free of charge and provide you with a quote so that you can also see the significant savings that can be achieved by forgoing the logo. At IKS Locksmiths we are Master Locksmith Association approved and our security grilles offer excellent quality, workmanship and value for money. Your security and peace of mind is our priority which is why we offer a free security survey to help you identify any security issues within your property. From the survey our MLA qualified locksmiths will be in a position to advise you on the most appropriate security solutions for your individual needs. We provide an emergency call-out service and will respond to your call 24/7, with no charge for call-out so please don’t hesitate to call IKS Locksmiths anytime on 0800 612 5659.